Photo by Elisabeth Caren and Myles Pettengill. Filmmaker Jessica Sanders spoke with Cultured Vultures this week in advance of the world premiere of her new short film, End of the Line, at the 2018 Sundance Film Festival. Thank you for taking the time to talk with Cultured Vultures today. How are things treating you? Great! Thanks so much for writing about my film! Your new short film, End of the Line, premieres at Sundance this weekend. What drew you to Aimee Bender’s short story? I read the story twelve years ago when it came out in Aimee’s book, Willful Creatures, and I’ve always been obsessed with it. The image of a tiny man in a cage stayed with me. Also, in a short amount of time, the story explores deep themes about power dynamics, desire and connection. The Big Man has a small, lonely life and the Little Man has a big, richer life, as he has a family, he’s educated and well-traveled. The story examines deep themes in a playful, unexpected and extremely visual way. It’s been a creative dream come true to tell this story as I’ve been passionate about making it for so long. Also the opportunity to work with Refinery29 and TNT with Shatterbox has been incredible. It’s not really discussed in the film, but how did Simon Helberg’s character get so small? The world that’s established—there is a little world and a big world that co-exist, so it’s not like Downsizing where you get shrunk down. It’s just the rules of this surreal world. 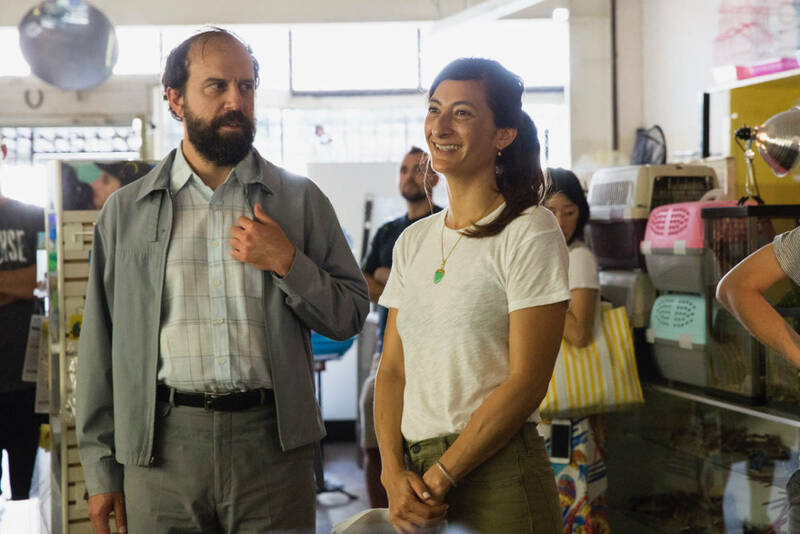 I’m not sure if there’s something about Brett Gelman but it’s always fascinating to see him tackle such unlikable characters such as the one he plays in this film. What kind of performance were you wanting to get from him? I didn’t want Big Man (Brett Gelman) to be unlikable. I want you to feel bad for both men. Big Man is looking for love and connection so he goes to the pet store and buys a companion. The Little Man is not what he expected. In some ways, the Little Man is distasteful in that he’s a little arrogant which is unexpected. Brett brought so much humanity and emotional range to Big Man, the climax of the film I was blown away by his performance. It was incredible working both with both Brett and Simon, as they brought such distinct perspectives and approaches to their roles. They elevated their characters from the page and brought so much depth and nuance. It’s been a joy to have collaborated with them, I love how their two energies create an emotionally complicated story. Brett Gelman, Simon Helberg, and Jessica Sanders. Images by Elisabeth Caren and Myles Pettengill. How timely is it that the film deals with men in power? The story was written 12 years ago but like you said, I think it’s very timely that the film is coming out now. A woman wrote the story, I had a female screenwriter adapt it, and I am exploring male dynamics and abuse of power through a female lens. With what’s happening daily in the news about abuse of power, it feels perfectly timed that the film was made now. Do you think we’re going to reach the point where it won’t be so hard for female filmmakers to find work in the industry and get hired by the studios? I’m glad that there’s a lot of attention on hiring inequality, but I still haven’t see significant change in the numbers of women getting hired (Hollywood features are still only 7% directed by women). I’m excited that Refinery29 and TNT’s Shatterbox is helping change Hollywood in a real way by supporting female directors. I see change happening, like Courtney Hoffman getting hired by Amblin to direct a studio feature after Steven Spielberg saw her Shatterbox short, “Good Time Girls.” Hiring practices in Hollywood need to change by actually hiring women directors, as it’s not for lack of talented and qualified female directors. I don’t know if laws need to be enacted to help support hiring equality. I’m hopeful for change. What influenced you to get into filmmaking? I grew up in a filmmaking family as I have Oscar-winning documentary filmmaking parents. They are amazing role models and mentors. I love that filmmaking combines my interest in art, music, tech, and different stories. I get to explore a lot of different subjects. It’s a lot of fun and I’m extremely passionate about it. Outside of premiering your film at Sundance, what film are you looking forward to seeing the most while you’re there? My friend, Hannah Fidell, has a movie called The Long Dumb Road that I’m excited about. My background is documentary and a lot of my documentary colleagues like Nathaniel Kahn has a film about the art world (The Price of Everything). Lauren Greenfield has Generation Wealth. I’m excited to see my fellow shorts. I’m just excited to be in the film community celebrating film. There’s a lot to see! How many times have you been to Sundance? My first feature documentary After Innocence premiered there in 2005 and won the Special Jury Prize. I actually haven’t been back in competition with a film since then. My mom’s documentary Anita, about Anita Hill, premiered a few years ago. I’ve never been in the narrative competition so I’m excited about that. Any advice for someone who is going to Sundance for the first time? Stay warm and be open because you’ll be sitting on the bus or standing in line next to incredible filmmakers. You never know who you might meet. And see as many movies as possible. A selection of the 2018 Sundance Film Festival, End of the Line premieres as a part of Shorts Program 5 on January 20. Danielle Solzman is a film critic and a member of the Chicago Independent Film Critics Circle, Galeca: The Society of LGBTQ Entertainment Critics, Alliance of Women Film Journalists, and the Online Film & Television Association. She also writes for Solzy at the Movies.